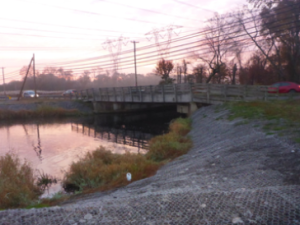 In 2016 Hydro-Marine Construction Co., Inc. performed the scour protection repairs for the Sicklerville Road Bridge located in Winslow Township, NJ. The bridge is a single span bridge measuring approximately 50’x50 out to out. Stone riprap protection was installed in front of both abutments and extended in front of the wingwalls on either side of the bridge to the shoreline. Geotextile material and approximately 157 S.Y. of stone riprap were used in the repair. Included in the contract was the concrete repairs for both abutments and wingwalls. Prior to installation of the scour countermeasures, maintenance and protection of traffic and soil erosion and sediment control measures were implemented including silt fences, topsoil stabilization and turbidity barrier. A stone construction driveway was required on both sides of the bridge, to allow the construction vehicles to access the area for the placement of the scour countermeasures. The installation of the stone riprap was done in two phases. A Portadam cofferdam system was used to dewater the areas for the installation of the scour countermeasures. Total cost for the project was $ 298,357.